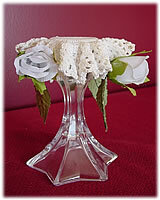 You’re looking for that special something for your wedding gift but not sure where to go. Call Karla de Jager at Hand Magic Creations. She’ll come up with the perfect crocheted or knitted piece that will give your gift that feeling that only a gift handcrafted with love can give. 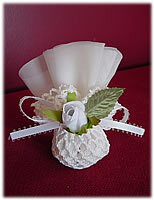 Wedding favours, home decor items, fashion items – you name it, Karla can crochet or knit it. Quickly and affordably too. Karla is a 3rd generation crocheting and knitting specialist who learned the basics at her grandmother’s side. While she produces a variety of beautiful, traditional designs, her imagination leads her to experiment with all manner of products, resulting in a variety of stylish and timeless works. All Karla’s work is done by hand at her workshop in Smithville. None of the threadwork is outsourced. 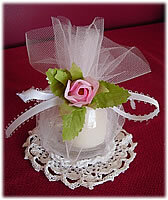 Karla’s wedding favours include such things as custom picture frame covers (above right), votive candles with crocheted doilies (left) and wine glasses filled with your choice of candies and topped in a variety of doilies and flowers (right and lower left). 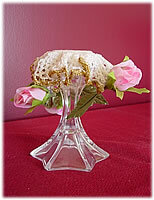 She also makes a variety of crochet-decorated table items, including candlestick holders and napkin holders (see below for samples of these and other works). If you’re looking for a wedding gift from the heart, talk to Karla about her custom bedspreads, quilts or table centerpieces. Each piece can be customized with the name of the bride and groom. The choice of material is up to you. From regular wools to more exotic threads like Alpaca and Cashmere, Karla can handle them all. As time goes on, many newlyweds become new parents. Hand Magic Creations also has a full line of products made in baby wool for newborns to toddlers. Baby afghans, travelling outfits, booties, mittens and christening clothes. Hand Magic Creations is here to help make your big day even more memorable. Call Karla today!